Sheboygan, Wisconsin (March 8, 2019) – Central High, Sheboygan North High, Sheboygan South High, and Tower Program are pleased to present “High School Art Spring Exhibition”, an exhibition featuring artwork from high school students. This high school art exhibition celebrates the creative vision and artistic voice of our student artists. It will feature 100+ pieces of student artwork created this school year based on the art teacher’s respective high school art curriculum. It will also feature works created outside of the classroom. Works will range from traditional media to experimental media including drawings, paintings, mixed media, collage, fashion, 3-D works, and so on. Art teachers participating are Lizabeth Higgins (Tower), Frank Juarez (Sheboygan North), Antoinette Mattern (Central), and Brian Sommersberger (Sheboygan South). This is their first collaborative art exhibition bringing four art programs together. This exhibition runs from April 5 – April 13, 2019, with areception on Friday, April 5 from 6-8pm. EBCO ArtWorks is located at 1201 Erie Avenue, Sheboygan, WI 53081. Come meet the student artists and their art teachers. The gallery will be open on Saturdays, April 6 and April 13 from 11am-1pm. For further information on this exhibitionplease contact Brian Sommersberger at bsommersberger@sasd.net. Location: Silver Lake College, Lake’s Edge Gallery, located on campus at the Franciscan Center for Music Education and Performance, 2406 S. Alverno Road. There is a reception for the students on May 9, 5-6pm. Description: Art students from Sheboygan North High School created sixteen works of art ranging form paintings to collages and drawings to ceramics for their exhibition, “Excited About Something”. This exhibition explores the idea of self-expression without structural boundaries. These student artists selected their own substrate, thematic unit, and intent for their artwork. My paintings are driven by a collection of certain things I feel can influence my work. In my studio I reduce those visuals into paintings with a minimalistic approach. Through my practice, I am able to bring what is important to the surface so that the viewer can interpret his/her own meaning. I really enjoy drawing and painting portraits. People are so interesting! I was inspired to make an Impressionist-style painting of my teen-aged son and daughter as they were having breakfast one morning. They each had “perfect hair,” which is very important if you are in middle school. The peaceful way that they enjoyed their pancakes, along with the beautiful colors in our kitchen that morning, seemed to call me as a mom and as a painter. I really wanted to capture the positive feeling of the moment. I used gestural lines to block in the shapes, and I left some of the distorted perspective to increase that feeling of a fleeting moment. The trees are on fire. The ground is black and the fire lights up the sky. The sky has different shades of red and brown. In this painting the trees are a dark brown with some green and black. This painting represents rebirth and second chances. In the painting there are trees on fire. One of the trees is burning to the ground. The sky is lit up with color red. After the trees burn new trees and other plants can grow. This is a cycle that allows plants to regrow and start over. When a forest fire starts it destroys the trees but over time more plants and trees will grow again. This painting means that after something bad happened that a good thing can come out of it too. The internal battle between the good intentions and compulsive, sometimes dark, nature of each individual is depicted. Although the white seems to overpower the bold colors of black and red, they manage to be seen on the other half, and through the gaps of the purity. It tells you that everyone is different and we should respect everyone no matter where they came from. The inspiration for this piece came from my previous experiences with collage and nature. I wanted to change the action of the subject in the work to form a simile between bad habits and how they feel to an individual. This painting is about a girl who feels lost because of family health problems that seem to get worse, she looking back on earth because she feels out of touch from society and she doesn’t fit in. She has no one who understands what she is going through so she feels alone. My painting is about a full moon in a galaxy sky with a shadow tree and blue greenish grass. This painting is about being free and just go with it. To see what happens I mixed the colors while the paint and wet. By making the darkness and lightness in the sky it makes the painting stands out with the purples, pinks, and blues. My painting makes me feel calm. It looks like a real place that I want to go to lay down in the grass, look up into the sky above and rest my eyes to relax. Mistakes are an art of their own. I was just visiting New York City in December. I wanted to make a painting to show the tall buildings. I used bright colors because I wanted to make it look modern. The purpose behind this canvas is that everyone, everywhere is different. It is saying how a man could have multiple personality disorder while a woman could be anti-social, etc. What and who inspired me to make this artwork was that I was working on a picture for a poetry booklet, but I had it the wrong way, so I decided to try and make a painting of it. Then my friend, Mason Tipton, told me I could make it about mental disorders. He even made me a list of mental disorders as a reference. My friend Talya Thurs said I could use the color blue to represent depression. This painting was a way for me to paint something that was fun, creative, and would look fun in a gallery. What it means to me is that not everyone understands the mental disorders that are out there. No matter the color of your skin, anybody can have a mental disorder of some kind. The title of my piece is, “The Guardians” I call it this, because the two figures drawn are meant to be seen as illusions, or guardians of nature. The purpose behind my piece is to draw attention to the destruction and pollution of the world. The two figures, or Guardians represent nature, one can be seen with a sad expression on it’s face. The sad expression on one, and the lack of a face on the other are representations of the sadness and despair they feel to have to watch the destruction of the world. I was inspired to create this, by a conversation I had about the Sheboygan River. My step-dad had made a comment about how grossly brown it was, and my mom said that it was clearer usually but because of a storm dirt was drug up to the top of the river. I couldn’t help but think that it was always this gross color, and it wouldn’t be if it weren’t for pollution of the river. I started out with a set of colors that looked nice together, and then went to different color schemes for each Guardian. What is it’s purpose: To me it has less than the average painting as while it is visually pleasing it lacks originality, and while this wasn’t what i was planning at first i guess it ended up being a nice mistake. For me really i can say i was more or less thinking of myself while painting this as i think highly of this album in general and with that being said i really took a liking to the cover, with it being a black and white photo but the person in the photo also wearing a mask led to an interesting amount of lights and darks. Overall it was also an easier thing to approach as skin tones aren’t my thing. I need really understood the orange square in the upper right corner but from what i can assume it’s there to keep it from looking so gloomy. Method: I went with darks and grays with choosing this as i stated earlier skin tones aren’t my thing. I gotta say it went from looking terrible at first to becoming something beautifully complex and i’m happy for it. I guess if i were ever to go about this again i’d plan something in the chance of it and go about something original as opposed to this. I make art to express what comes to my mind. Art makes me feel like I’ve released the creative side of me. My friend Natalie, inspired me to create more art. I quit drawing for a year, but she helped me get back to it. I used a stretched canvas and acrylic paint to achieve my artwork. This painting makes me think the girl is mortal and makes everything calm again. The meaning behind the painting is that every person in the world has a beautiful face. There are many different and unique features on a face that differ on people. The girl’s face within the painting is representing the way I see some beauty of different people within the girl I designed. Her hair contains multiple colors, including a medium brown, red, and yellow. The dots upon her face are like a tattoo. I love to see the beauty in everything in life, no matter what it is. Within the paint there is a little heart next to “PTV” and music note on the side, which represents my favorite band, because the music they made helped me through some stuff. In the beginning there was no plan on what I was going to paint, but in the end the paint turned out to be beautiful to me. 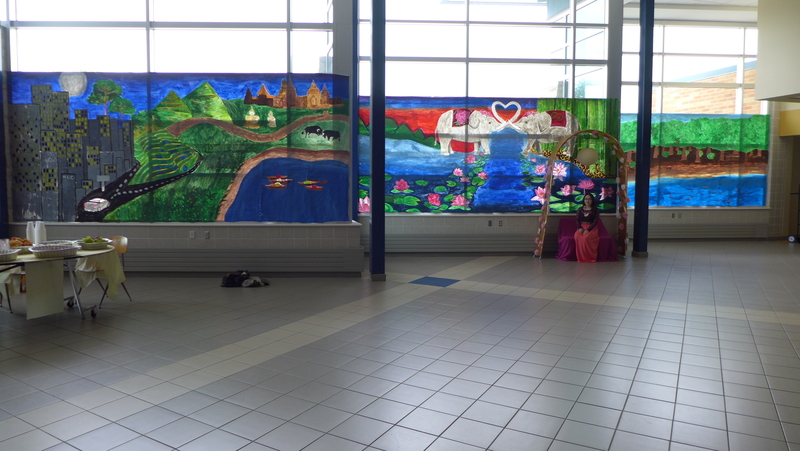 Mr. Miller always finds ways to incorporate art into the programming of the Hmong Leadership Council. 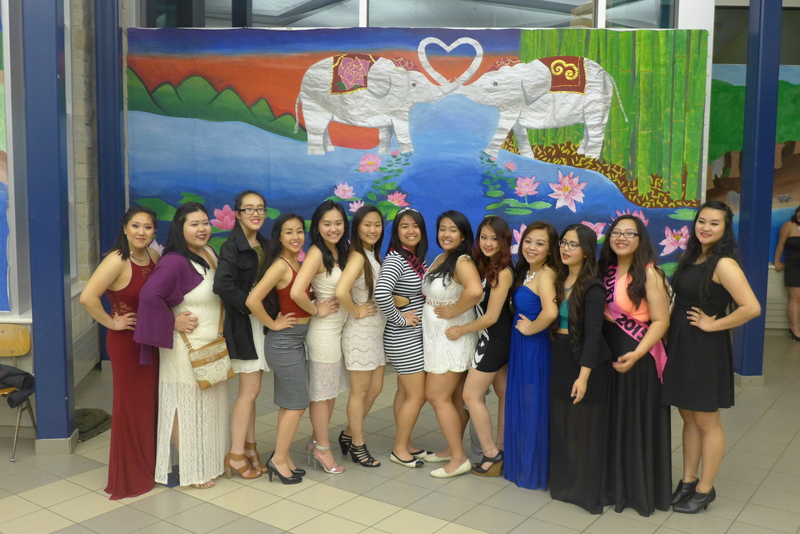 Below is a great example of what transpired during a spring formal at North High School. Thank you for sharing, Mr. Miller. 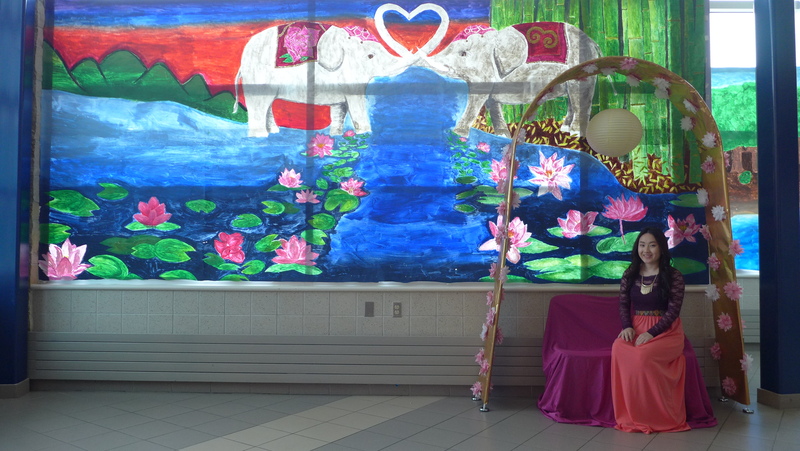 I thought you might like to see some of the art from our spring formal: Bangkok fading into a lotus lagoon, bamboo, and a lake by the jungle. Senior, Savannah B. was the lead artist and important contributions were made by Paris H (’14) and Sophomore, Lilly K. About 30-40 students worked on the murals. I finally confronted my blending phobia and am proud of what I was able to do with Paris on the water and beach areas! Thanks for always letting me share this work with you.